While my freshmen students knew Romeo and Juliet is a tragedy, the details on the relationship of the “star-crossed lovers” were a little fuzzy. 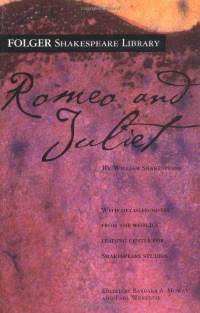 Romeo and Juliet is often a student’s first introduction to Shakespeare for not so surprising reasons. The characters Romeo and Juliet are young-she is 13 years old. They are in love. Their families stand in the way of their love. They must meet in secret. They defy the authority of their parents. Many of these elements appealed to my 9th grade students. But there were surprises everyday when we performed scenes from the play in class. Of course, they were almost always terrible. Shakespeare’s verse is difficult to read “cold”. Who nothing hurt withal hiss’d him in scorn. Each of the students stumbled over the strange vocabulary: prolixity, holp, God gi’ god-den, tetchy, sirrah, obsequy. Matthew wondered aloud why Capulet is always saying, “What? ho!” Michael regularly referred to the language of the play as Old English; he would not be convinced otherwise. Act Five began last week, and the students were following the complicated plans of Friar Lawrence and making predictions as to the plan’s success. There was a brief discussion about what an apothecary was in Shakespeare’s time, and the actual distance from Verona to Mantua, Italy. It was obvious, they all wanted the plan to work. Then, Nick as Romeo entered Juliet’s “tomb” and several lines later, he stepped over Chase who lay on the floor, slain as Paris. Nick began his soliloquy with great seriousness. Holding the dry erase marker, our stage prop for the vial, high in one hand, he read the verse aloud, “Here’s to my love! O true apothecary!/Thy drugs are quick.” He dramatically uncorked the marker, and then “drank”. He gasped, ” Thus, with a kiss,” he leaned down to the sleeping Juliet, and quietly said,” I die.” Staggering, he fell to the ground. “But Juliet’s still alive!”started as a murmur. I was surprised. I thought they knew. The final speech of the play begins, “A glooming peace this morning with it brings”; that speech captured the mood of my students. Of course they understood at some literal level that the play was a tragedy; this fact was clearly stated on the back cover of their text: This is the tragedy of Romeo and Juliet. However, until that moment of Romeo’s willful self-destruction, followed by Juliet’s suicide, my students did not appreciate the play’s heartbreaking conclusion. I was surprised by the level of their reaction. Ours was not a polished performance, the staging was clumsy and the actors read the lines without understanding much of what was being said. However, they did feel for the characters, always willing to summarize what had just happened or wanting to give advice. Despite our failures to interpret the language, the result was that the play made them grow up a little. No one should ever be surprised at the ability of this Shakespeare play-however rudimentary in performance- to engage an audience.